Stained mattress cleaning for a customer in Camden, NW1. Removing huge cranberry juice and ink stains from a high quality customer mattress. Comfortable sleep is why mattresses exist in the first place, and a dirty mattress is contrary to any type of comfort in sleep. The discomfort created by a dirty mattress may not become very evident right at the moment when the soiling happens, but, certainly, later when that soil inevitably starts to deteriorate in the mattress, those dirty spots will affect the sleeper’s beauty rest. Our customer, who got cranberry juice and ink stains on their mattress, was very clear in their mind about the effect of certain soils on their mattress. The fact that they persistently tried to clean the cranberry juice mattress stain before calling us at Home Maid Clean is evidence enough. There was a double jeopardy in the case of the cranberry juice on the mattress. Liquid soil on the mattress was one problem, and that it is a food item that caused the stain was the other part of this dirty mattress dilemma. Urgent and professional steam mattress cleaning was required. Steam cleaning a mattress is best to get it rid of pollutants, completely. Due, of course, to the sterilizing and extraction aspect afforded, naturally, by this cleaning process and the type of state of the art steam cleaning machinery used, which a dirty mattress typically needs to properly clean it. Liquid, dust and other things very easily make way into the cushy interiors of a mattress and, not only cause material compromise and break down over time, but also will cause foul odours when food items, particularly liquid ones, and dust begin to ferment. 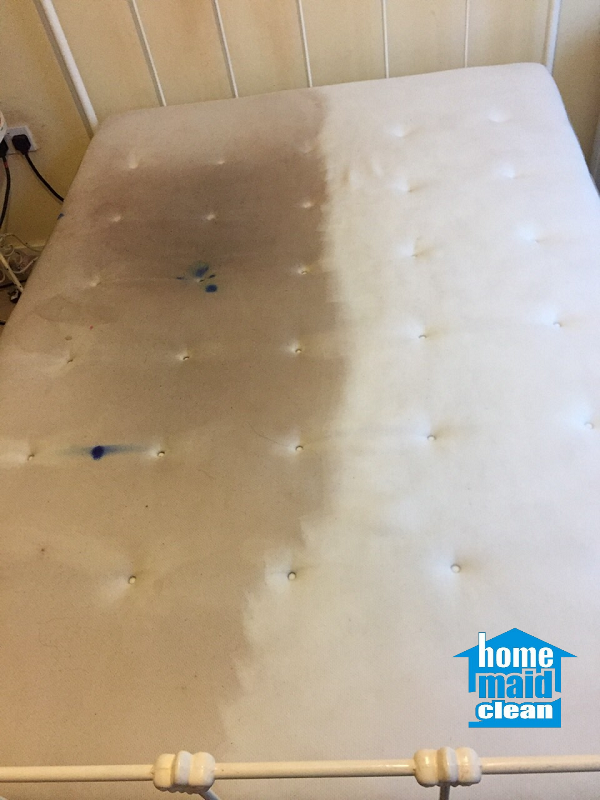 To combat this undesirable effect cranberry and ink stains were treated and steam cleaning was administered to the mattress. 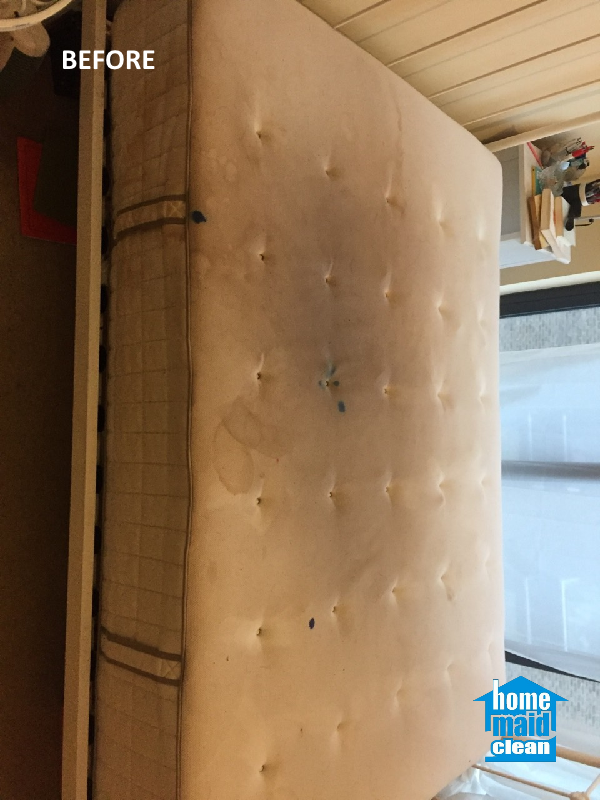 This challenging stained mattress cleaning resulted in a sterilized, perfectly clean mattress. Not only were the mattress stains completely taken out, but any contamination that was on the mattress or the interior, otherwise, also benefitted from the cleaning and germ killing effect of the steaming process; which also meant – no bad odours! 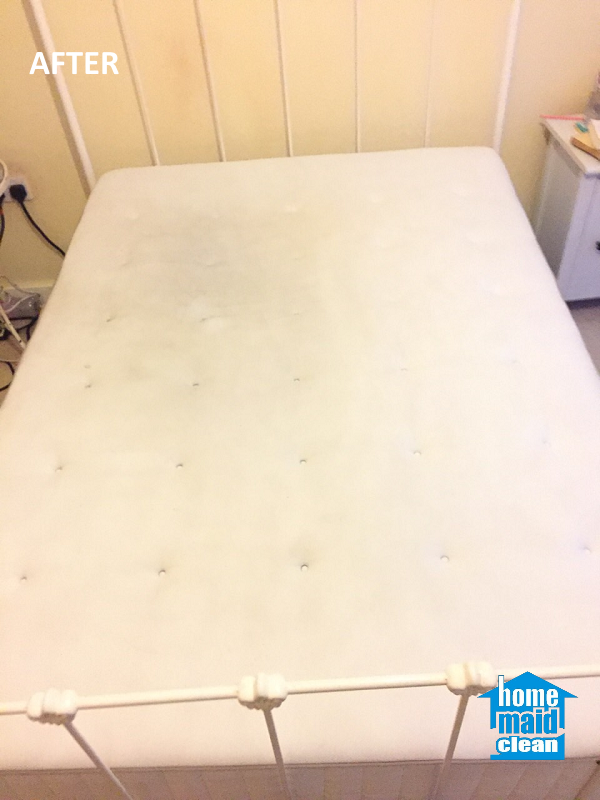 Our customer was quite pleased with the outcome of this mattress cleaning project. Check out our mattress cleaning service and call us to restore the cleanliness and comfort of your own mattresses, too! We clean everywhere in London within the M25 and take on urgent bookings at no extra cost. Check out our Special Offers for monthly package offers and discounts.